Discover a colourful line of unisex fragrances that ooze in style and sophistication. This affordable range of stunningly scented perfumes offers a wonderful variation for whatever your occasion. 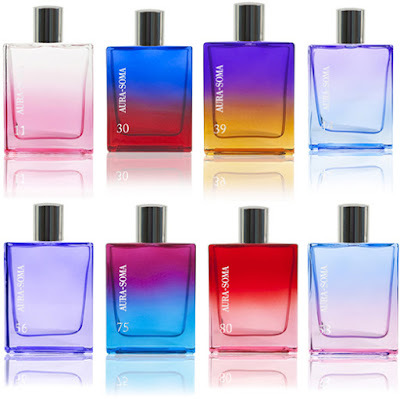 Aura-Soma Pegasus fragrances demonstrate the visual and non-visual energies of colour, created using only natural and organic essential oils evoking a beautiful aroma and the potential to enlighten the wearer's mood. Until the development of modern perfumery in the 1880s, fragrances were made using natural materials. Since that time the marketplace has become dominated with perfumes made using synthetic chemicals, fixatives and solvents. With a strong philosophy of using natural and organic ingredients, the range is dedicated to actively working with the earth's ecosystem, supporting the plant towards a healthy and harmonious future. It's a noble philosophy that represents the thinking of many health and beauty brands across the ever competitive market. This stunning collection consists of eight uniquely scented perfumes - all very much varying in scent. Although it's labelled as a unisex line of fragrances, the perfumes do vary in femininity and masculinity. The scents vary from sharp and potent to soft and smooth. It really does depend on what your preference is, but all the scents can certainly be used by men and women. The Aura-Soma Pegasus collection really is a stunning range of well-branded perfumes with a strong philosophy and uniqueness that helps them stand out from its competitors. If you're looking for a new fragrance to try out, then be sure to check out the Aura-Soma Pegasus perfumes.